The slopes of Mount Kinabalu in Borneo are the only home of the world’s largest pitcher plant – the Rajah Pitcher plant. Its traps can hold 4 litres of water and in 2010 a remarkable discovery was made. 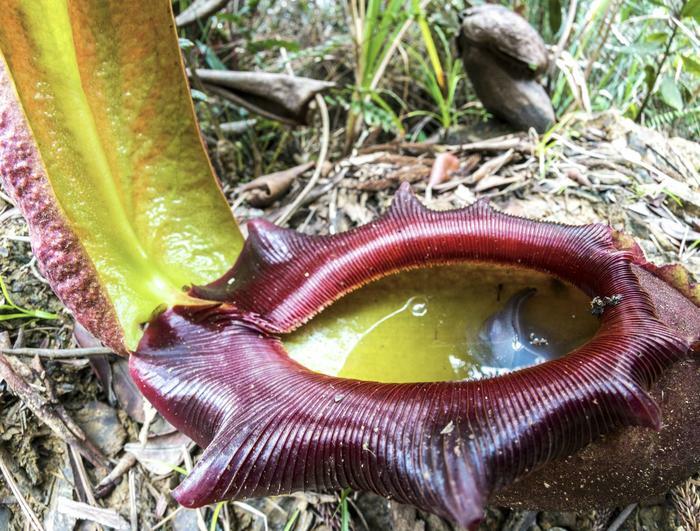 The Rajah Pitcher traps insects like most pitcher plants, but it also gets sustenance from an unusual source. 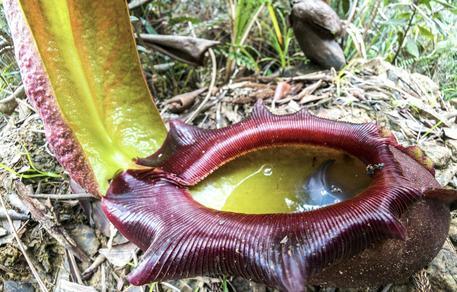 The lid of the pitcher secretes nectar, which attracts the mountain tree shrew, like the pitcher another endemic – found only on the slopes of Kinabalu. The shrew straddles the pitcher as it licks off the sugary treat and often urinates or defecates into the pitcher as it is feeding. The pitcher is a shrew loo! The plant absorbs nitrogen and other minerals from this convenient fertiliser. At night, the tree shrews are tucked up in bed, but the nocturnal summit rat, yet another Kinabalu endemic, emerges to carry on fertilising the pitchers. With such an extraordinary story in such a stunning location, Kinabalu was high on our list of targets for the film. We staked out two pitcher plants, one with cameraman Kevin Flay hidden in a blind some 6 metres away with a long lens and the other with a remote camera set up right next to the pitcher, feeding back to recording equipment hidden in a blind along with myself. And for the nocturnal rats, we also had infra-red cameras and lights. Everything in place, Kevin and I settled ourselves down for many long hours waiting. The tree shrews visited the pitchers about every 3 or 4 hours, but only for about a minute or so each time – so it was going to take time to build up the sequences. This high up the mountain rain is a constant threat, so we built a shelter, to store equipment not being used. It also provided a retreat for us in really heavy rain. One morning, we were sheltering from a persistent drenching storm with Chi’en Lee, one of the discoverers of this extraordinary behaviour, bemoaning the fact that we hadn’t even started on the nocturnal rat sequence yet and killing the boredom by munching our way through the last of our supplies of dried banana when Chi’en heard a rustle in the grass. A furry face popped out of the vegetation. “Look!”, said Chi’en, “a summit rat – that’s incredible. They’re strictly nocturnal – I’ve never seen one out in the day before!” We expected the rat to flee as soon as it realised where it was, but instead it walked calmly into our shelter. Clearly, it was as fed up with the rain as we were. Chi’en was still clutching a last fragment of dried banana and slowly extended his hand to offer it to the rat. As if such treatment should be expected for a rare endemic, the rat reached up and calmly took the banana. We had almost eaten our entire supply, but some frantic scrabbling around located a few more scraps, which the rat accepted directly from Chi’en’s hand. Clearly it was here until the storm passed and expected a decent lunch. We were watching entranced, when we suddenly realised that Chi’en was still miked up from shooting sync pieces earlier in the day. 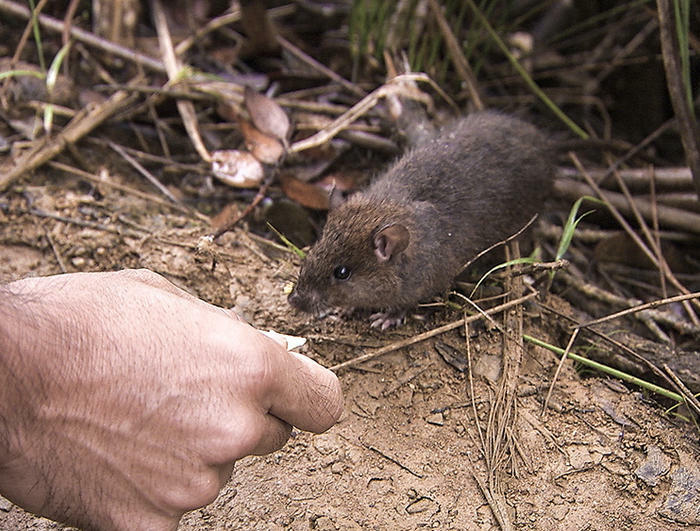 Kevin pulled the camera from its rain cover and hissed to Chi’en: “Feed it again, and tell us what is happening!” No need for stealth – as soon as Chi’en produced another flake of dried banana, the summit rat stretched up on its back legs to reach it even before Chi’en got his hand close to the ground. The rat happily sat a few inches from the camera, sharing our lunch for nearly half an hour, until the rain stopped and it headed off. It had a good lunch out of the rain and we had a unique sequence that we could never have dreamt was possible. To watch the trailer for the two-part documentary ‘Plants behaving badly’ and read some more about its content, feel free to follow this link.